Brightly colored hallways and large windows flooding the STEM building with natural light hope to provide a warm welcome to students. 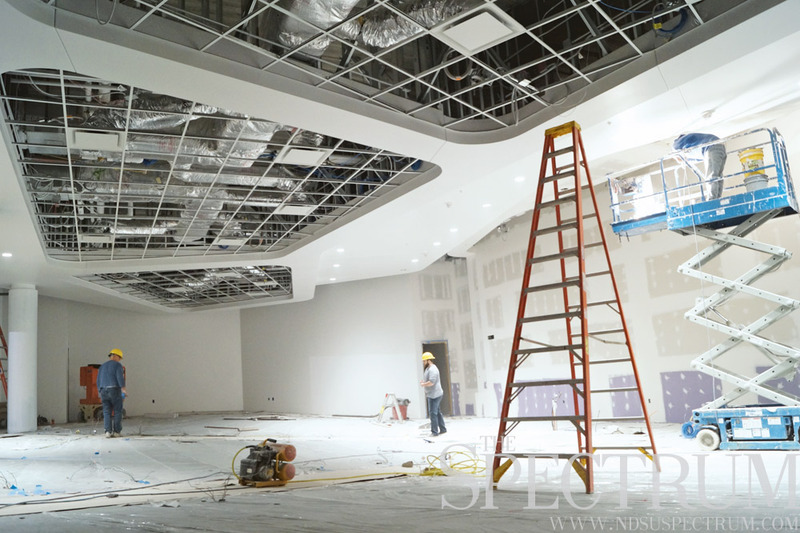 The building’s auditorium will be able to fit 300 students comfortably. 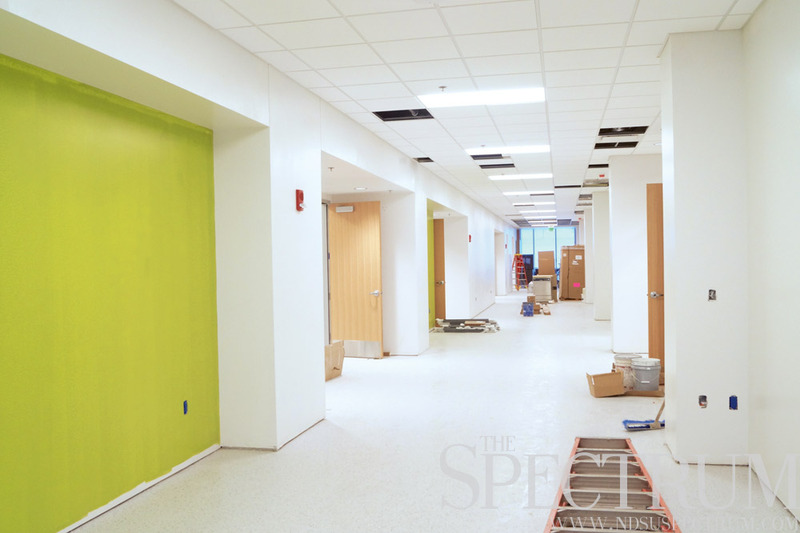 Finishing touches are underway in NDSU’s STEM building. Whirring fans and the smell of sawdust greet the entrance of the STEM building’s south entrance. 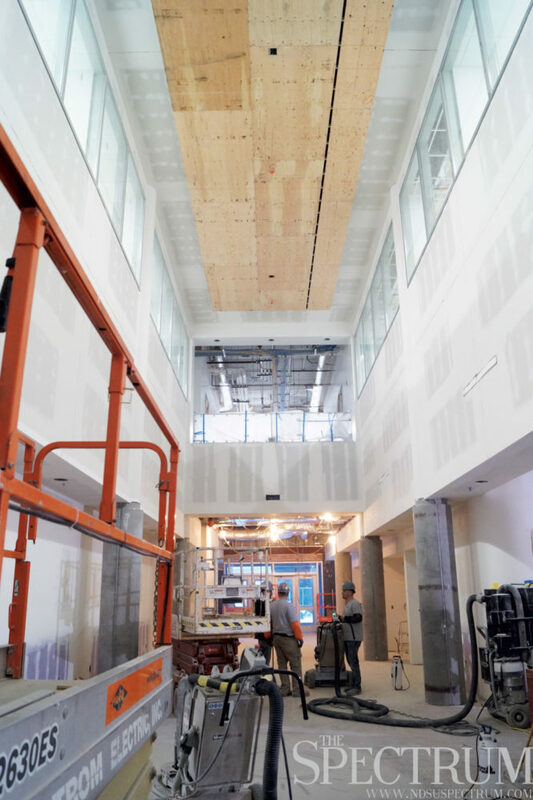 Construction workers are applying finishing touches to the building’s three floors as furniture, ceiling tiles and light fixtures wait in boxes stacked in the spacious classrooms. 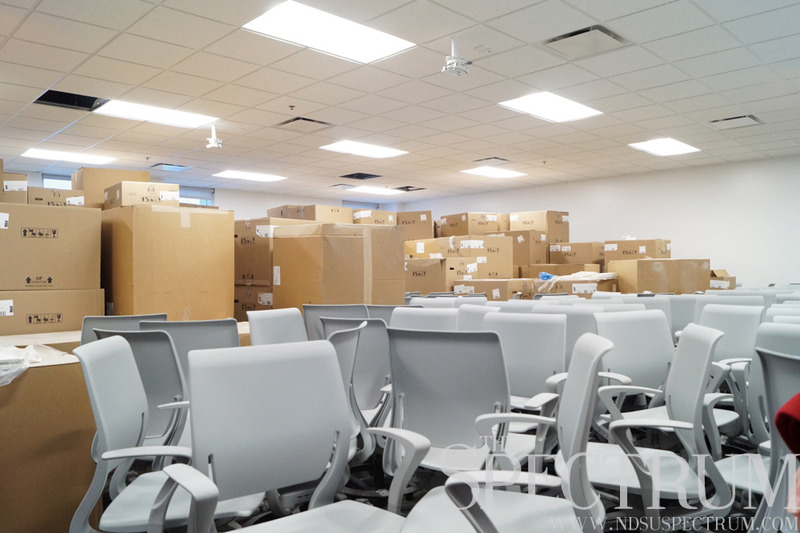 After a year and a half of construction, the new classroom building on North Dakota State’s campus is set to open Jan. 11 for spring 2016 classes with predicted traffic of 4,000 to 5,000 students daily. 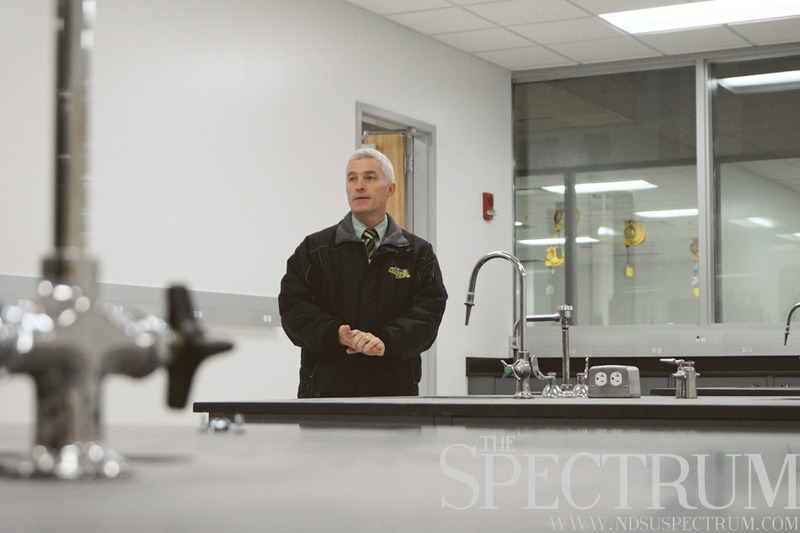 The STEM building is “new charted territories” for NDSU and its students, facilities management director Mike Ellingson said. “This building is the first building that breaks from (a department focus) and is for everybody,” said communication coordinator Anne Robinson-Paul. “There is not one faculty office in this building,” Ellingson said. Three stories tall and sitting east of the Memorial Union, the STEM building holds nine classrooms and 23 labs, which range from moveable table labs to fume hood labs to a fluids lab. Several labs are connected by prep spaces, Ellingson said, where teaching assistants can prepare lessons. A STEM building prep space is 10 times larger than the prep space available in Van Es Hall, Ellingson said, and features environmental chambers, or freezers. 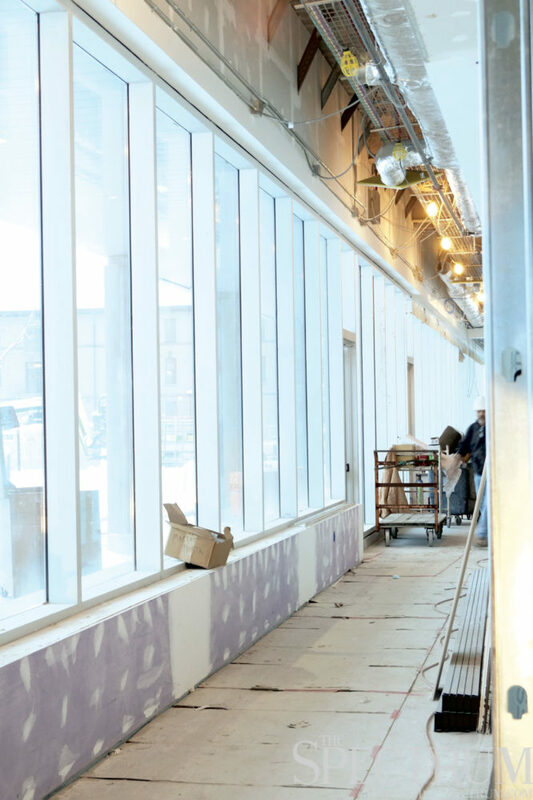 The STEM building’s labs also offer alternative spaces for classes unable to work in other buildings such as Ladd or Dunbar halls due to renovation or other issues, Ellingson said. He added the possibility to keep the STEM building open for student use 24 hours like the Quentin Burdick Building has also been floated. STEM building rooms can accommodate any number of people, from its 24-person labs to a 48-person computer cluster to a 300-person auditorium. “When you go around, you’re gonna find they’re all slightly different,” Ellingson said, adding every room has at least two doors regardless of purpose. Study spaces, or “huddle spaces” as Ellingson said, are found all over the STEM building, from its windowed hallways to a first floor walkway. Students can look out over University Drive, Dinan Hall and the entire campus to the north from the STEM building’s windows, which allow for more natural light, something Ellingson was advantageous with the STEM building. Another plus for students that Ellingson pointed out was the retention and small expansion of Churchill Field. 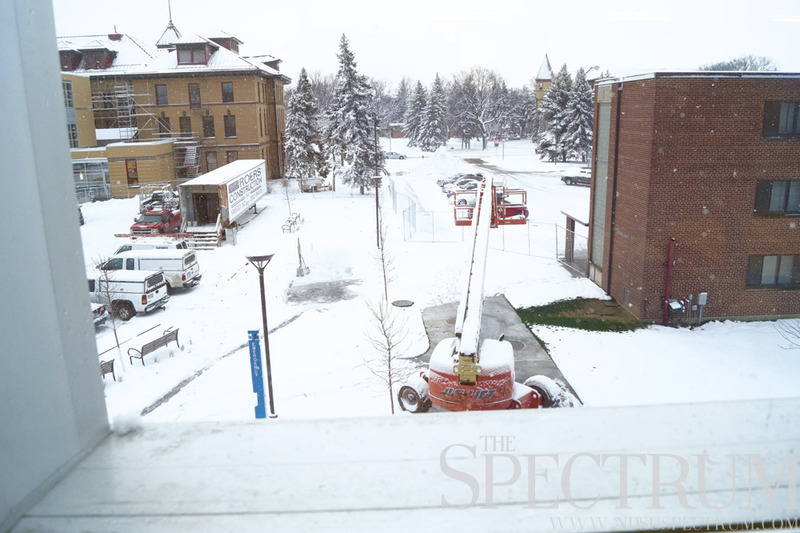 The green space was an item of contention in planning the construction of the STEM building as some students feared NDSU’s only green space would be lost to another building. Churchill Field, lined with red flags indicating irrigation lines, will remain intact with irrigation running under it. The green space actually grew somewhat, Ellingson said, adding that 2013-14 student body vice president Erik Diederich walked Churchill Field during the programming period of the STEM building construction. “The actual green space here will be as big if not bigger, according to (Diederich),” Ellingson said, adding that construction did bring down a few trees, some due to sickness and danger of falling. The STEM building will also feature six entrances including a tunnel opening at the dining block in the Memorial Union basement. The building’s naming rights are still “out there,” Ellingson said, though a potential donor did tour the building, pondering the possibility of naming the structure after themselves. While not every student will utilize the STEM building, a great many will, Ellingson said. “Every freshman who has to take chemistry, or sophomore, will have class in this building,” he said.